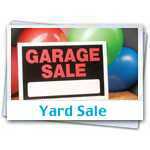 YARD SALE Saturday Only Rain or Shine April 27th. 8 FAMILY YARD SALE 616 Shelbyville Road Saturday 7am-4pm Fishing & hunting items, household, clothing (all sizes), much much more. Cancel if Rain!